Do you want to see how an inbound strategy works? 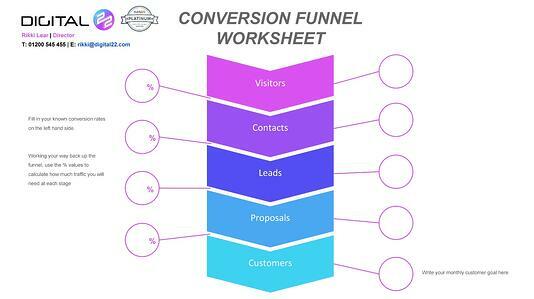 Want a shortcut to get your inbound plan off the ground? 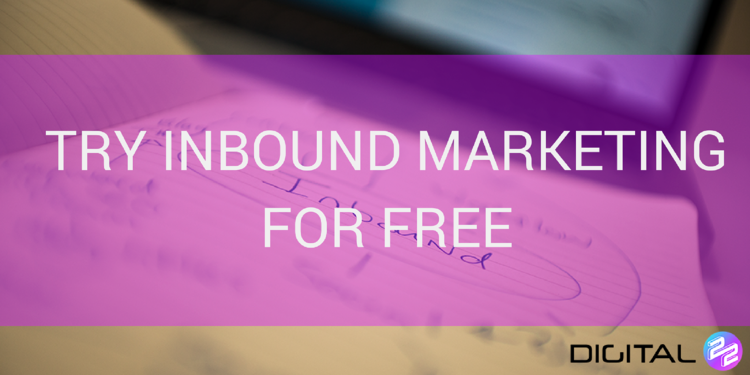 Or perhaps you wish you could try inbound marketing for free? Well, our inbound starter pack is the solution. We're offering free inbound marketing templates, which you can use to help get a better understanding of inbound and have a go at mapping out your own plan. The best way to find out whether an inbound plan is for you is by having a go yourself. Here's what is included in our starter pack. In our free downloadable starter pack, we have five templates you can use for planning your inbound strategy. Taking the time to map out your plan will help you engage effectively with your ideal buyer persona, ensure your strategy is designed to attract and convert leads, and nurture contacts into customers. An organised and thought-out inbound plan helps you identify problems and create solutions that will benefit your ROI. A content audit is an analysis of all the current content you have on your website. In an inbound marketing strategy, the content on your blog helps to attract visitors and bring traffic to your site. Your content has the potential to help people during the different stages of the buyers journey. During the awareness stage, when a buyer is looking to understand their problem, your blog can help them find answers and get a better understanding. In the consideration stage, your content can offer solutions which will then help them move onto the decision stage where they make a decision of what product (or service) they're going to buy. Having a content audit lets you plot out which stages of the buyers journey your current content belongs in. It will help you see if you're lacking in specific types of content. (For example: you may have more 'consideration' blog posts rather than 'awareness'). 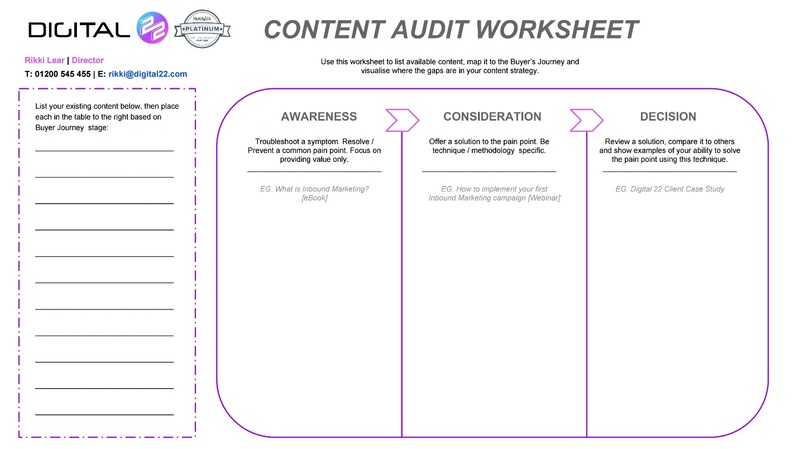 Content audits can be a labourious task but with our worksheet you can easily list your current content, determine what is lacking and create a focused content plan going forward. Email workflows (also known as email automation and drip marketing) are designed to nurture your contacts with helpful and relevant emails to convert them into customers. (Here's a best practice to follow for inbound email workflows). Mapping out your email workflow, helps you decide what type of emails you want to send out. Sending emails that aren't helpful can quickly be viewed as spam (and this can cause you to lose potential customers). Along with the topic of your emails, our worksheet helps you stay focused. "What is the end goal of this workflow?" having that question in mind means you can set out your workflow towards a specific objective. 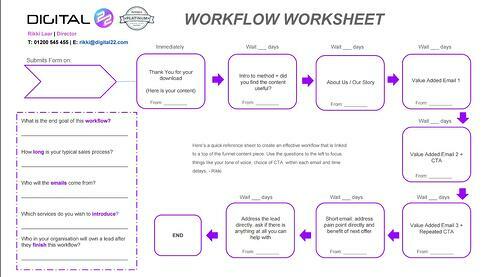 There are other important questions you have to answer on your workflow before you can turn on your email automation (and they're all included in the worksheet). As you'll likely have a team working on different areas of your inbound marketing plan, you need monthly goals and aims for everyone to work towards. This helps you stay focused and keep moving forward. Understanding your ideal buyer persona(s) is core to everything you do in your inbound plan. Once you understand the buying habits, goals, pain points, etc, about your ideal customer you can create content that successfully engages with them. As you already know. If you read a blog that helps to fix a problem and offers solutions, it's likely you will return to that blog and be more receptive to that company's marketing. People appreciate helpful and relevant marketing. A Day In The Life: what is daily life like for your ideal customer. Understanding their habits and goals will help you create content that engages with them on a personal level. Income: how much do they earn? Can they easily afford your services? Pain Points: what problems do they have? How does your service/product help fix these problems? Answering these key questions will help you create helpful content that resonates with the needs and wants of your buyer persona. People appreciate it when they feel like a business understands them and is on the same wavelength. The buyer's journey is the process buyers go through before making a purchase. 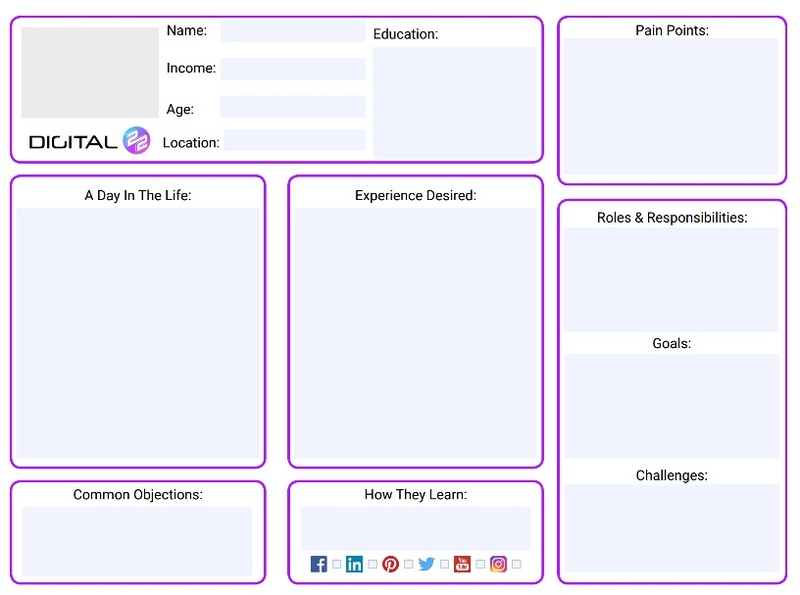 Once you understand your ideal customer, you can use this to map out what content will be best. Your content should help move your ideal buyer onto the next stage of the buyer's journey. 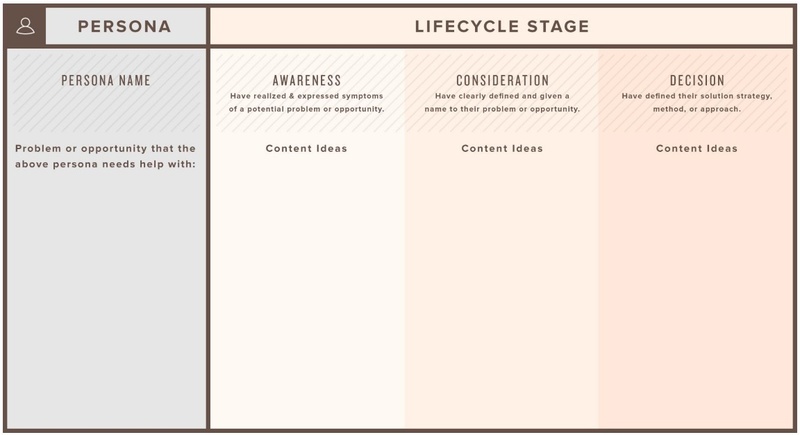 This template can be easily used to put your content ideas into different stages and keep your content plan focused on your end goal. You can download our starter pack for free. We understand it can be hard to understand how inbound marketing works but with these templates you can see how an inbound strategy can benefit your company. And best of all you can get started with inbound straight away. If you have any questions about inbound marketing, contact our team. As a Platinum HubSpot agency, we have helped businesses throughout the UK and abroad with their inbound strategy.